This article is about a Lakitu cloud. For Wario's pet hamster, see List of implied characters § Fluffy. 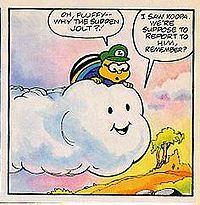 Fluffy is a Lakitu's Cloud utilized by a Lakitu in the Nintendo Comics System issue "Cloud Burst". Unlike most other clouds, he is shown to be capable of speaking. Fluffy is also much larger than a regular Lakitu Cloud, having room on his body for two people and an extremely large amount of treasure. In "Cloud Burst", Fluffy aids his boss, a kleptomaniacal Lakitu, in stealing the treasures of both Bowser and Princess Toadstool. It is unknown what became of Fluffy at the end of "Cloud Burst" after Luigi pulled his escape hatch, dumping all of his and Lakitu's loot onto the ground below. This page was last edited on March 27, 2018, at 14:53.